The use of animals in research, testing and teaching is covered by a self-contained set of provisions – Part 6 – within New Zealand’s animal welfare legislation. This is because the nature of such use of animals may mean that general obligations under the legislation cannot be met. This recognises that compromised care and some pain and distress to a small number of animals may result in significant benefits to people, other animals or the environment. However, such use carries with it significant responsibilities and strict legislative obligations. Part 6 of the Animal Welfare Act 1999 allows the use of animals for research, testing and teaching purposes only in accordance with a code of ethical conduct which has been approved by the Ministry for Primary Industries. 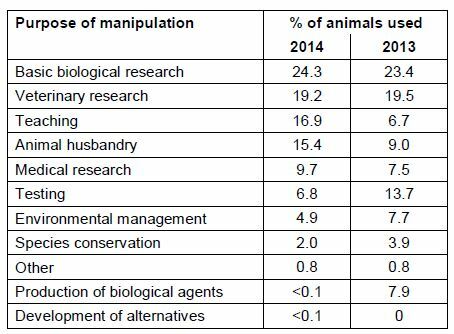 In 2014, the total number of animals used in research was 310,287, up 38% from 2013. While this seems a large rise from 2013, it should be noted that the numbers of animals used each appears to fluctuate wildly between around 200,00 and 350,000, as we can see below. The main rises were in cattle, fish, and deer. 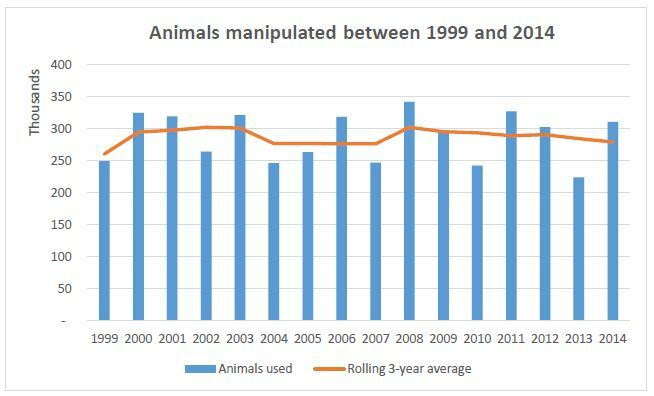 Trends in New Zealand animal experiments 1999-2014. Click to Enlarge. 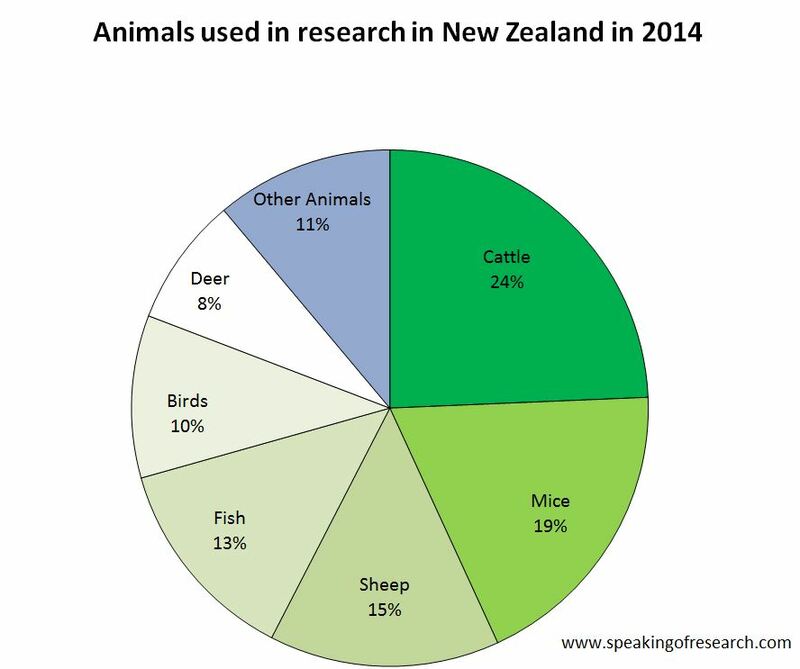 Whereas in most countries mice, rats, fish and birds account for over 90% of animals in research, in New Zealand it is under 50%. Instead over 45% of animals are cattle, sheep and deer, reflecting the huge amount of agricultural research being done. Interesting only less than 1% of cattle and deer die or are euthanised (compared with 97% of the mice). See Appendix 1 for more information on the proportion euthanised. Here is some other interesting information provided by the annual statistical release. Page numbers refer to the source in the annual report. Speaking of Research seek to be the best source of information on the internet on animal research and testing statistics. Unfortunately language barriers mean that we often find it hard to get statistics from non-English speaking countries. If you speak multiple languages and are able to help us out finding the statistics from other countries we would be very grateful. See more here. 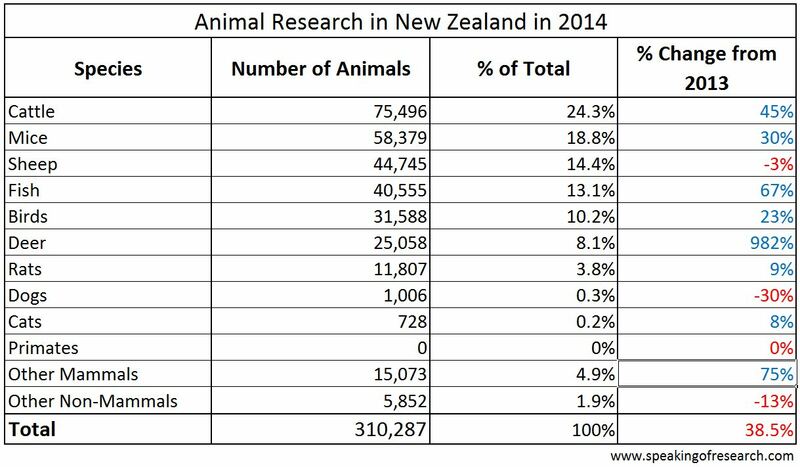 Posted on February 16, 2016 February 16, 2016 by EditorPosted in News, StatisticsTagged Animal research statistics, New Zealand, Statistics.